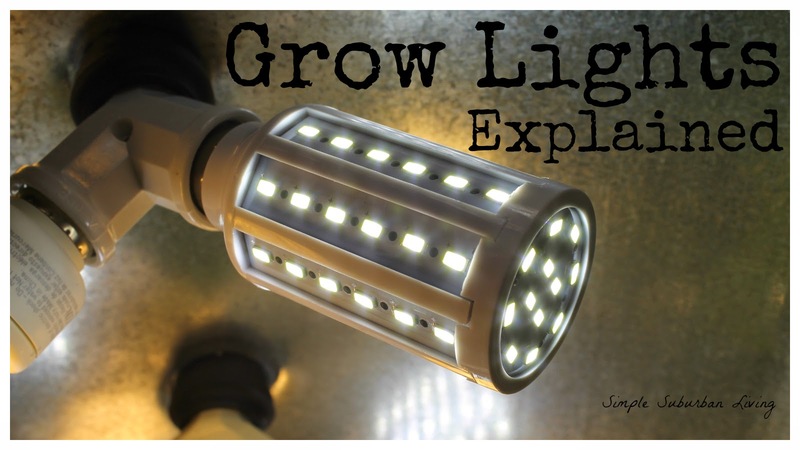 Using homemade fixtures and off the shelf light bulbs you can grow your own food year round. Here's a link to how I built mine. There are some basic terms and features to understand before you dive in and I hope to explain those terms here. The first thing to consider when choosing lights to grow indoor plants is color temperature. Color temperature is measured in Kelvins and is a measurement of a lights color spectrum. This normally ranges from about 2700K up to 6500K for most off the shelf light bulbs. Different color temperatures have different effects on your plants. The higher 6500K light will induce green leafy grow in your plants and is going to be at the heart of any grow light. 2700k light will induce flowering in plants and although this is not 100% needed for most plants it can help keep fruit production up in your plants. Anything in between 2700k and 6500k is not efficiently used by the plants and therefore should not be used in a grow light. The next term to understand is lumens. Lumens is a measurement of light intensity and should be listed on most modern bulbs. The higher the lumen rating the more light power the bulb can produce for grow in your system. This is commonly confused with watts which are a measurement of power consumption and not the amount of light power that a bulb is capable of producing. This leads into the next term which is lux. Lux is a measurement of lumens per square meter of space and is a great way to test your grow light's potential growing capability. You can use an app called RGB sensor for android to test your Lux power by installing the app and holding your phone at various levels under your light. This app also shows you the color temperature of the lights as well which can be handy to help you determine if you are getting the correct 6500k or 2700k spectrum. Lastly, the terms watts should be understood. Again, this is not a measurement of anything more than how much electric energy a light bulb is using. The lower watt rating the better (given the same lumen rating). For example a CFL bulb might use 23watts of power to produce 1400 lumens but an LED bulb might only use 14 watts of power to produce the same amount of light power (lumens) making the LED the best value. The more energy efficient you can make your grow lights that happier you will be with your energy bill! This is one of the many benefits of going with LED bulbs as much as possible. CFL bulbs also degrade over time so after a year or two you will notice a drop in light intensity. LED bulbs do not suffer from this degradation and also last much longer than CFL's.